Muslim pilgrims pray at the Grand Mosque, ahead of the annual Hajj pilgrimage in the Muslim holy city of Mecca, Saudi Arabia, Aug. 16, 2018. A Muslim pilgrim drinks water distributed by Saudi volunteers near the Grand Mosque, ahead of the annual Hajj pilgrimage, in the Muslim holy city of Mecca, Saudi Arabia, Aug. 18, 2018. 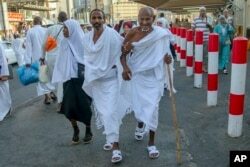 Muslim pilgrims walk toward the Grand Mosque to offer prayers ahead of the annual Hajj pilgrimage, in the Muslim holy city of Mecca, Saudi Arabia, Aug. 18, 2018.The annual Islamic pilgrimage draws millions of visitors each year. FILE - Two children pose for the camera while pushed by their father, who walks to cast stones at three huge stone pillars in the symbolic stoning of the devil, during the Hajj, outside the holy city of Mecca, Saudi Arabia, Sept. 3, 2017.